While most viewers tuned into the Pre-GRAMMYs Show last Sunday night to see what the stars were wearing, our eyes were scanning the Red Carpet for something else: gorgeous hair color! Rihanna: Much different from the dark, straight hair that complemented her edgy alter-ego, this year, RiRi opted for a lighter, more playful look. With cascading auburn highlights that enhanced her golden complexion, coupled with lengthy, lived-in texture, her updated do truly showcased how a subtle change in color can effect your entire persona. We were totally feeling a more youthful, carefree vibe from her. “We did decide prior to color her hair! Not for the GRAMMYs per se, but for life,” says Rihanna’s longtime hairstylist Yusef Williams. Does this foreshadow a new glamorously-laid back Rihanna? We’re lovin it! Jennifer Lopez: J.Lo’s colorist knows a thing or two about balayage! By gently connecting her existing color with new babylights, a popular technique that combines foil work with hair painting, JLo’s “hair refresh” looked stunning. We love that she only needed some soft, simple additions of color to keep her look fresh-faced and enticing — the true mark of a well-rounded colorist. Maren Morris: Maren first came onto the music scene rockin bronde shoulder length hair. Fast forward a year later to the 2017 GRAMMYs (and a win under belt! ), and she is completely transformed with gorgeous extensions and wearable, blonde balayage. Her updated look stays true to her original “girl-next’-door” aesthetic, but with elements of total glam. The additional length speaks to her growing star power, while the gentle blends of blonde balayage keeps her relatable, trendy, and down-to-earth. We suspect her picture to be the one that’s torn out of magazines, and brought into salons everywhere. Lady Gaga: Of course we could count on GaGa to turn heads (and possibly break some necks) with the hottest new hair shade trend: blorange. “Mother Monster” adorned her signature platinum with hints of this trendy hue: a beautiful mosaic of orange, red, and pink. She perfectly balanced edginess with everyday, wearable color by adding subtle pops of the shade to the ends of her hair — just enough drama without appearing too loud or over-the-top. And for an artist who has made her career off of doing just that, we love this toned down, attainable, “cool girl” vibe. This look is the perfect example of transforming fun, trendy color into an accessible, ready-to-wear look. She could rock it on the Red Carpet, or at the grocery store! Heidi Klum: From blonde bombshell to bronde bombshell, we are loving Heidi’s updated look. Delicate baby lights framed her face, and melded beautifully with a gorgeous rooty bronde. Extra points for complementing her hair color with a smoky brown eye. Adele: We can always count on Adele for a killer cat eye and these 2 words: Timeless Elegance. 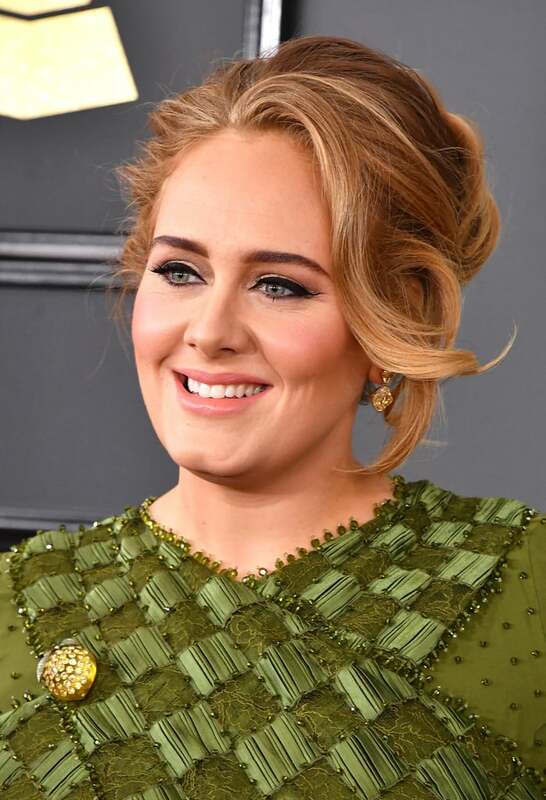 Beautiful, wearable color never goes out of style, and with a few modern accents, Adele redefines and totally owns the term. The hints of strawberry in her warm blonde hair gave her a modern look that perfectly suits her sunny, relatable personality (not to mention her glowing skin tone!). Her hairstylist Chris Appleton says he wanted to give her an “Old Hollywood” look with a modern twist to keep her “effortlessly glam.” And we couldn’t help noticing (and loving) how different features of her hair color popped with her 3 different outfit and hair changes throughout the night. To recap: “I Woke Up Like This” texture, that strategically shows off subtle hints of color, ruled the Red Carpet this year. It seems that the goal of Glam squads everywhere was to create effortlessly chic looks, that are just as wow! as they are wearable, for true everyday glamour. What was your favorite hair color moment of the GRAMMYs? Tell us in the comments below, and show off your eye for color!